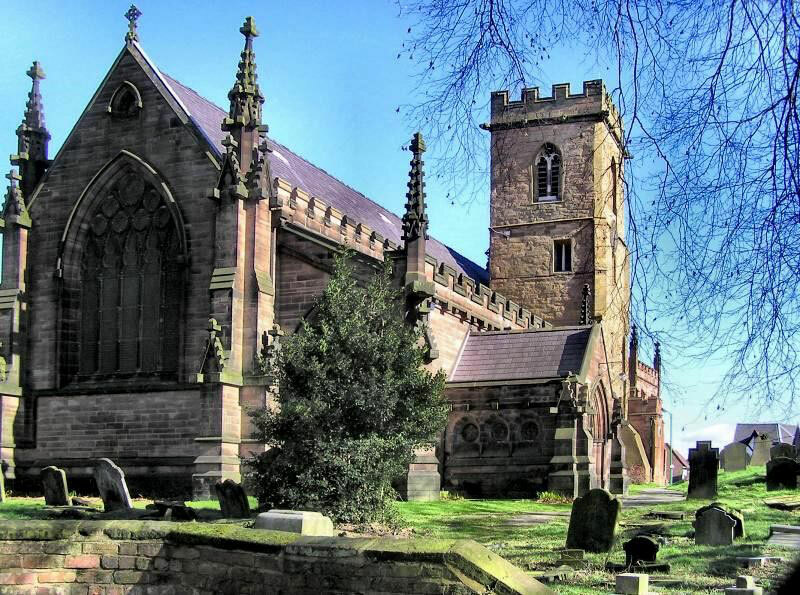 First documented in 1200, Handsworth Church is best known for its memorials to three industrial pioneers, Matthew Boulton, James Watt and William Murdock who are buried in the church vaults. St Mary's is known as the 'Westminster Abbey of the Industrial Revolution'. See A Church near You - http://www.achurchnearyou.com/handsworth-st-mary/. You might be interested in A History of Birmingham Places & Placenames . . . from A to Y - Handsworth - http://billdargue.jimdo.com/placenames-gazetteer-a-to-y/places-h/handsworth/. In 1086 the overlordship of Handsworth is shown in the Domesday Book as one of the many holdings in the Midlands of William FitzAnsculf of Dudley Castle. Drew held the manor under William. 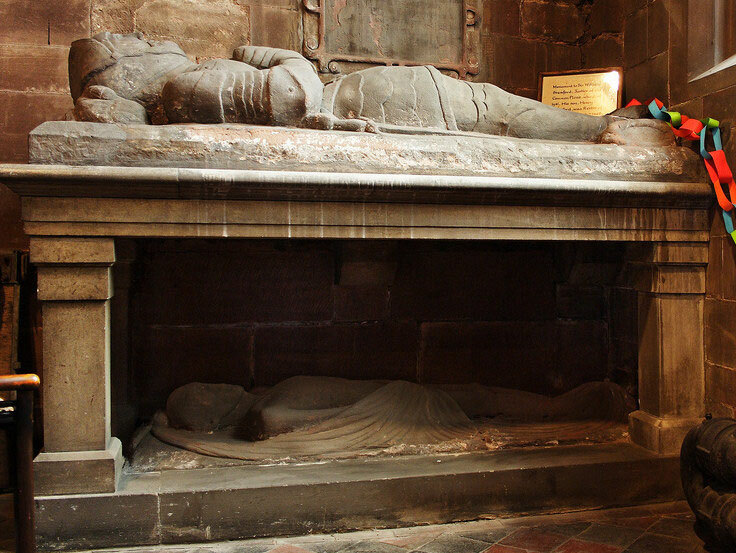 Towards the end of the reign of Henry II d.1189, Pagan/ Pain de Parles, very likely a Norman, married Alice, very likely an Anglo-Saxon, who brought as her dowry the manor of Handsworth held under the Baron of Dudley. From 1212 when the manor was held by William de Parles, the records detail a protracted, intermittent and costly dispute of the ownership for over a hundred years, complicated by the fact that William's lands were declared forfeit for his support of the enemies of King Henry III, and the imprisonment by Roger de Somery, Lord of Dudley, of a later William de Parles who was subsequently hanged for felony. The later manor house of Handsworth was Hamstead Hall, now demolished. However, there are field name references near the church which almost certainly point to a 12th-century moated house, which is very likely to have been the original manor house. Probably when the new hall was built at Hamstead in about 1450, Handsworth Rectory was built on the site, which now lies beneath the fishpond in Handsworth Park. There is evidence that the Wyrley family also held part of the manor and the manor house itself from the 13th century. 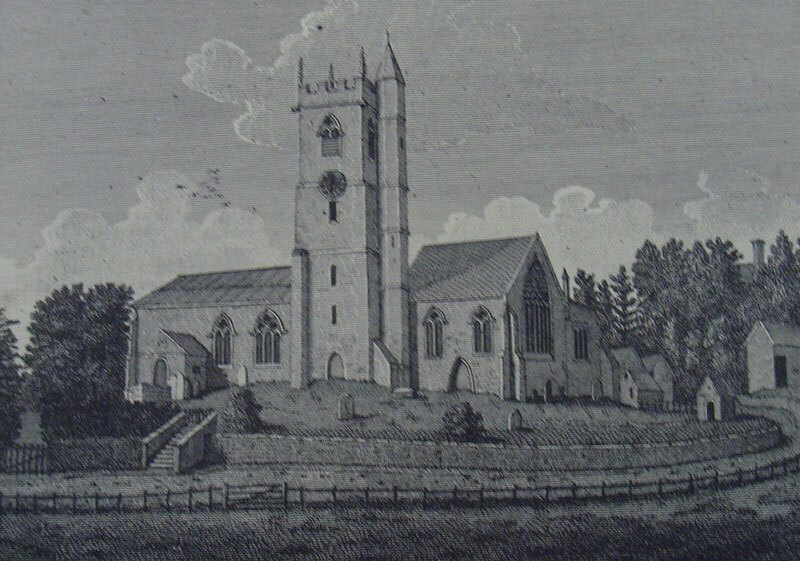 In 1228 one of the family, William de Wirleia is recorded as rector of the church of Hunnesworth. The manor passed through many hands by inheritance or purchase until it was bought in 1679 by Humphrey Wyrley. He passed it to his son, also Humphrey, whose grandson John Wyrley Birch died in 1775 leaving it to George Birch and his wife Anne, the great grand-daughter of Humphrey Junior. In 1819 the Birch family moved to Norfolk and the manor was sold by George's son, Wyrley Birch to the Earl of Dartmouth of nearby Sandwell Park. In 1200 the advowson of the church was claimed by Pagan/ Pain de Parles in right of his wife, so it may be that her family was originally responsible for the building of the church here. After c1272 the manor was held by Roger de Somery and his successors and the advowson subsequently passed through many unrelated hands. The church of St Mary's is a Grade II* Listed building. A church here is documented in 1200 when a priest serving the church of Handsworth is mentioned, though the church must be of earlier foundation. 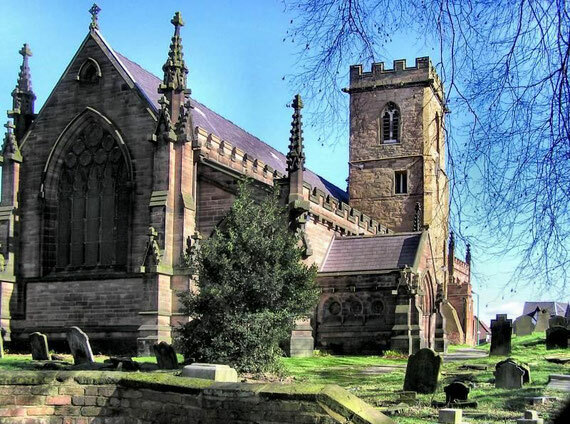 In the 13th century Handsworth church owed a pension of 2 marks to St Peter’s, Harborne. 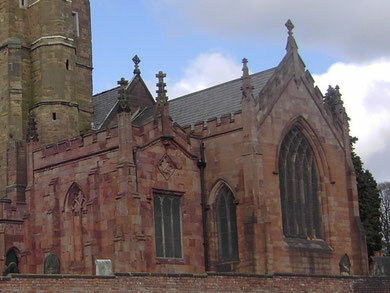 It has been conjectured that Harborne was an Anglo-Saxon minster church and that Handsworth was a dependent chapelry. The oldest remaining part of the church building is the lower part of the tower which is 12th-century; the upper tower having been added or rebuilt in the 15th century. The font may also be medieval. The octagonal bowl measures almost a metre across and has grooves at both top and bottom edges. At the restoration of the church in 1878 was described by The Handsworth Herald as being used for a farmyard trough. The north chapel has a 14th-century piscina that was reset here as part of the restoration and some remains of early 16th-century work. A plan of the church made two years before alterations in 1820 shows that the building consisted of a chancel and nave, north and south aisles and tower. The north aisle ran the whole length of the nave and chancel, forming a chapel at its east end. Much of the building at that time dated from the 14th century. Handsworth in the late 18th century was an attractive area for the wealthy industrialists and merchants of Birmingham to build their mansions. It had been connected by turnpike to Birmingham from 1727 and was only 4 miles from the town, a half-hour ride at a gentle trot. By 1800 the rural church was failing to accommodate the increased emigration of the Birmingham rich. The church had been little altered externally apart from the addition of a neo-classical-style porch, but rented box pews had been built inside the church which, because of their size, had served to decrease the seating available. And so, in 1819 it was decided to enlarge the church with appropriated pews but also to provide 250 free seats. These major alterations and extensions were carried out by the Birmingham architect, William Hollins who rebuilt the north aisle and added a north transept. Hollins had wanted to retain the medieval north arcade, but with a classical regard to an open auditorium the restoration committee insisted on wide arches with narrow columns, albeit in a gothickish style. The wealthy industrialist, James Watt reputedly said that retaining the old narrow archways would be like ‘pitching the word of God through a keyhole’. And when the rector was told that the tower might be unsafe, he hoped it might fall so that a completely new church could be built, presumably in a neo-classical style like the new churches in Birmingham. Existing box pews were rearranged and new box pews were built, the rent of which would pay for the work. The church was almost filled with box pews including some very spacious ones in the chancel. Sixteen windows were blocked by galleries. Indeed the internal arrangements were completely 18th-century in style, the prime consideration being for the congregation to adequately see and hear the preacher while sitting in the best-afforded comfort. The newly-built church fabric was in early 19th-century gothic and was later held in low esteem for its lack of authenticity. The east end of the church: the Watt Chapel is on the left of the photograph. The south-east memorial chapel to James Watt was added in 1826. It is attributed to Birmingham-based architect Thomas Rickman, although this is by means certain. Designed in Decorated Gothic style it has a three-light traceried east window and vaulted ceiling. 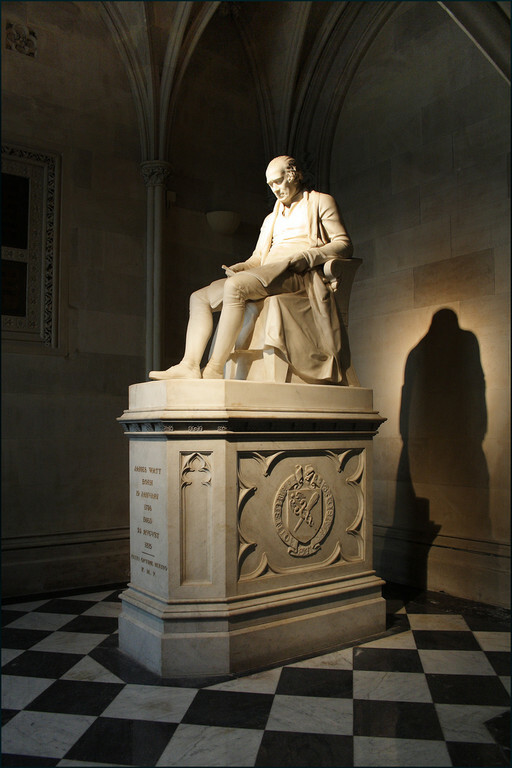 There is no altar but standing alone is a plinth bearing the seated white marble statue by Francis Chantrey of James Watt thoughtfully studying one of his plans. 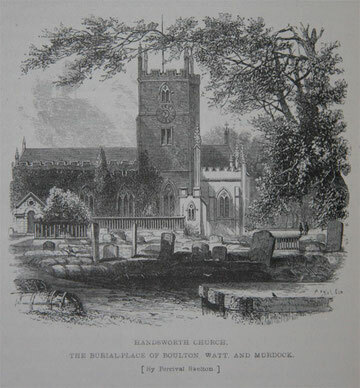 Handsworth Church before the 1876 restoration - Image from Samuel Smiles 1865 Lives of the Engineers Boulton & Watt - See Grace's Guide - http://www.gracesguide.co.uk. Continuing population influx and developments in church architectural fashion, prompted further calls for rebuilding. By 1875 dissatisfaction was being expressed about the church parts of which were unsafe. The building was felt to be too small and the 1820 work was now held to be in poor taste. It was now thought that the 1820 restoration in ‘modern gothic, [had been] executed at a time when church architecture was but little understood’. The loss of the north arcade was bemoaned and the whole was considered ‘incongruous, undignified . . . a shapeless mass of mere masonry.’Having just finished rebuilding St Martin's-in-the-Bull Ring, J A Chatwin was called in. Chatwin’s examination showed that the columns supporting the roof were being pushed outwards by the roof timbers and that the north-east corner was in imminent danger of collapse. The builder, contracted to do the work, Samuel Briggs of Balsall Heath, confirmed his suspicions and recommended that work start immediately. Chatwin quoted to restore the church to a correct gothic style, to reroof the church, to extend nave and aisles by twenty feet, remove the galleries, open up the tower arch, rebuild the lost arcade and chancel arch, address subsidence caused by vaults, restore the damaged mullions caused by opening up the window spaces, replace the Georgian porch, replace box pews with benches and to remove all whitewash and plaster. Chatwin was also asked against his better judgement to plan for a second north aisle; he felt the money would be better spent on ornament. In the event he was overruled. Space for seating was a priority for the restoration committee. The Gazette’s assertion that only work of the last century would be removed was over-optimistic: Chatwin’s restoration was almost a rebuilding of all but the tower. 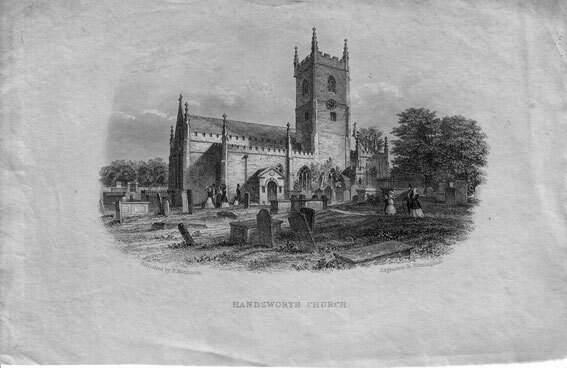 Handsworth church after the addition of the Watt chapel but before the 1876 restoration. Image kindly submitted by Mary Whittaker. From 1876–1880 the 14th-century south aisle was rebuilt and lengthened, the two south windows were replaced by four, and the two-bay south arcade was replaced with one of four arches. The nave and north aisle were extended west, the chancel was extended east, an arch was built between the north chapel and north aisle, the north transept was made narrower, and a new outer north aisle was built. However, it was considered only fitting for ‘this large and influential parish’ to have ‘a church worthy of its place, its position and history.’ As with St Martin’s-in-the-Bull Ring there appears to have been little opposition to the principle of almost complete rebuilding. Some Handsworth box-pew holders feared a loss of privacy. The last remaining objector was convinced when Chatwin told him that to retain uniformity of height with the new bench pews he would have to lower the floor of his pew. The objector felt he would be stepping into his grave and relented. It is doubtful whether Everitt would have had support for its retention. Even the preservationist, J T Micklethwaite maintained that it was acceptable to remove ‘modern’ (ie. Georgian) work. There are the tombs here of the lords of the manor, William Wyrley who died in 1561 and his wife Elizabeth in the west bay of the north arcade; and of Thomas Wyrley who died in 1598. They are tucked under the organ pipes on the north side of the chancel and very difficult to see. Also a 16th-century effigy thought to be of Sir William Stanford d.1558 on an open-sided tombchest containing a cadaver in a shroud, at the east end of the south aisle. 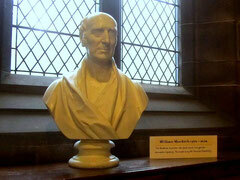 Sir William was the lord of the manor who rebuilt Perry Hall. And a mural tablet high on the east wall of the north chapel to John Fulnetby BD d.1636, Archdeacon of Stafford, Canon of Lichfield and the Rector of Handsworth. 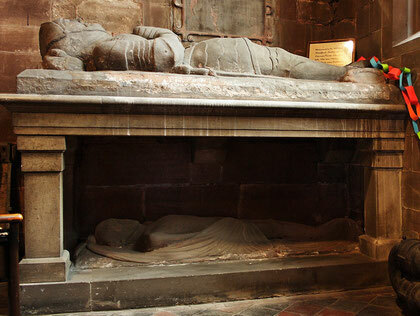 Reset at random in the floor north of the altar are 10 or 11 pieces of gravestone, which once bore the incised effigy of a man wearing 17th-century armour, and the remains of the inscription, including 'Joh. Harm . . . Esquier'. Sir William Stamford's tomb photographed by Ted and Jen Spiller on flickr - Handsworth Park Walk 8/10 - http://www.flickr.com/photos/tedandjen/sets/72157624910794882/with/4972125272 reusable under Creative Commons Licence Attribution 2.0 Generic (CC BY 2.0) - http://creativecommons.org/licenses/by/2.0/deed.en_GB. However, the church is best known for its monuments commemorating Birmingham's 18th-century industrial triumvirate of Boulton, Murdoch and Watt. The church has been dubbed 'The Westminster Abbey of the Industrial Revolution'. 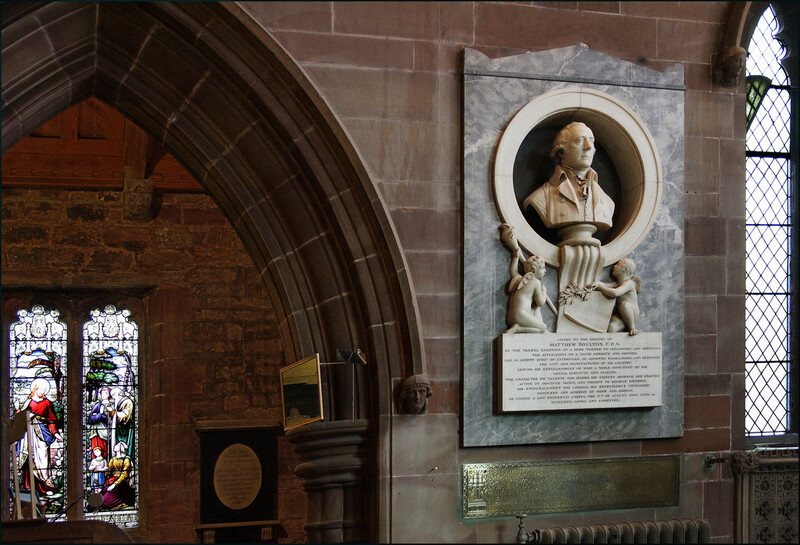 On the north side of the chancel is a mural monument with marble bust of Matthew Boulton d.1809 is set in a neo-classical roundel above two cherubs, one holding a relief of his Soho Manufactory. William Murdock who died in 1839 is commemorated in the chancel by neo-classical marble bust which stands within a gothic arch above a tablet which also bears the names his sons. 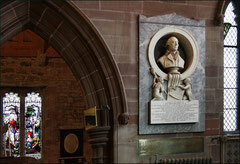 Alone in the specially built Watt Chapel is Sir Francis Chantrey's 1825 marble statue of James Watt. The great engineer who died in 1819 is depicted seated, deep in thought and holding a pair of dividers on a large sheet of paper. The pedestal was carved by Birmingham sculptors, William and Peter Hollins in gothic style to match the chapel. A similar Chantrey statue of Watt can be seen in Westminster Abbey. 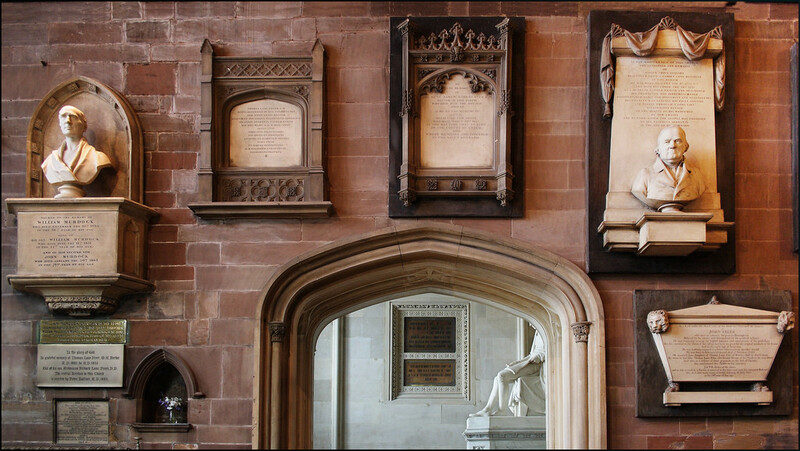 Click to enlarge the images of the memorials: top left and right William Murdock; bottom left Matthew Boulton; bottom right James Watt. Except for the image of the bust of William Murdock, photographs by Ted and Jen Spiller on flickr - Handsworth Park Walk 8/10 -http://www.flickr.com/photos/tedandjen/sets/72157624910794882/with/4972125272 reusable under Creative Commons Licence Attribution 2.0 Generic (CC BY 2.0) - http://creativecommons.org/licenses/by/2.0/deed.en_GB. 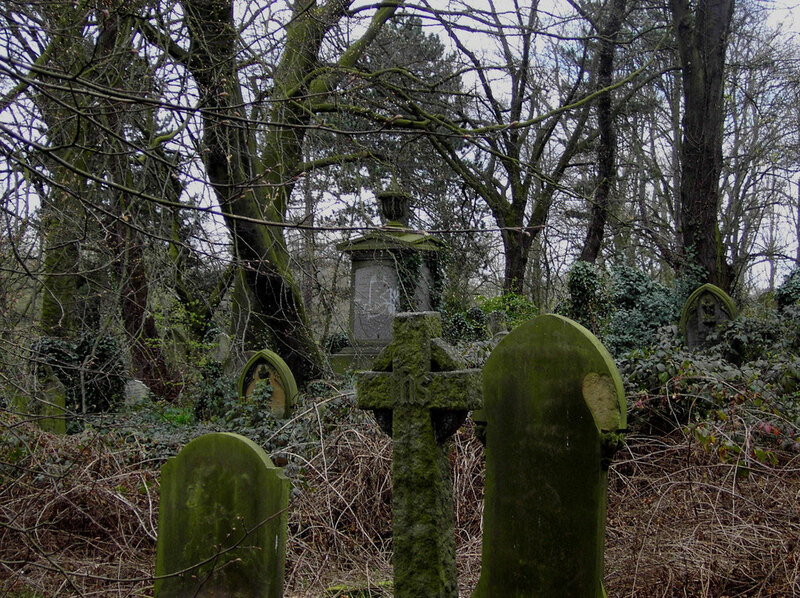 Among those laid to rest here are Francis Eginton d.1805, the noted stained-glass maker of who had worked with Boulton and lived near the Soho Manufactory. Of some 50 works his masterpiece is 'The Conversion of St Paul' in St Paul's Church in the Jewellery Quarter. Also here is the forger, William Booth who rented Booths Farm from c1800. He turned the top floor of the farmhouse into a workshop producing skilled forgeries of coins and banknotes. Hanged at Stafford Jail for his crimes in 1812, he is said to have met his death only at the third attempt. Here too are two men influental in the early years of Aston Villa Football Club, George Ramsey d.1935 and Wlliam McGregor d.1911. 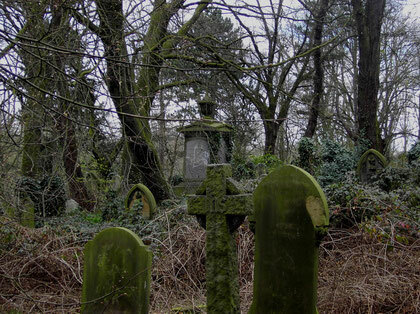 During the late 19th-century restoration part of a gravestone was discovered in an unusual place. When the south porch was demolished, an oval tablet was taken down from the pediment bearing the inscription, 'John Hall and John Hopkins, churchwardens, 1759'. In the interests of economy they had cut the tablet out of an old gravestone, the side built into the wall being inscribed, 'The bodye of Thomas Lindon, who departed this life the 10 of April, 1675, and was yeares of age 88'. In 1553 there were four bells, which were recast by Joseph Smith of Edgbaston 1701, to make a ring of 6. Two more trebles were added and the old treble recast in 1890. All eight were recast with scientific tuning in 1955 by Taylor's foundry in Loughborough. Handsworth Park Walk 8/10 - Ted and Jen Spiller on flickr - http://www.flickr.com/photos/tedandjen/sets/72157624910794882/with/4972125272 images reusable under Creative Commons Licence Attribution 2.0 Generic (CC BY 2.0) - http://creativecommons.org/licenses/by/2.0/deed.en_GB. Ronholpics Churches - Ron Hollins on flickr - http://www.flickr.com/photos/ronholpics/3527363319/in/set-72157617514014877/ images reusable under Creative Commons licence Attribution-NoDerivs 2.0 Generic (CC BY-ND 2.0) - http://creativecommons.org/licenses/by-nd/2.0/. Historic England website - https://historicengland.org.uk/listing/the-list/list-entry/1076358. My thanks to Canon Brian Hall for giving me access to the church, showing me round and sharing his considerable knowledge with me. Arrangements for visits can be made via the contacts page on A Church Near You - http://www.achurchnearyou.com/handsworth-st-mary/.